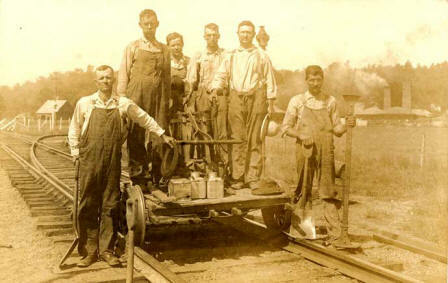 Owner Joe Robertson (back row far right) poses with employees of the Medora Brick Plant circa 1926. From the photo submitted by George L. Shepard of Seymour shared and run in The Banner in 1981. Thornton Heller, of the Jackson Brick and Hollow Ware Co. (Brownstown), and C.C. McMillan, of the Medora Shale Brick Co., sent by parcel post a brick each of local manufacture to be used in building a brick house at the coliseum, Chicago, during the Clay Products Exposition in March. These bricks will be among 25,000 sent by parcel post from every brick plant in the United States to be used in the construction of this house which will be given away and re-erected after the exposition. July 8, 1904 - formed stock co.
A 50-man workforce once produced 54,000 handmade bricks a day at the Medora Brick Plant. Founded in 1904 the company built initial components of a plant and began brick production with its first batch of paving bricks burned in March 1909. The company had chosen a parcel of land one mile outside city limits southwest of the small town of Medora. 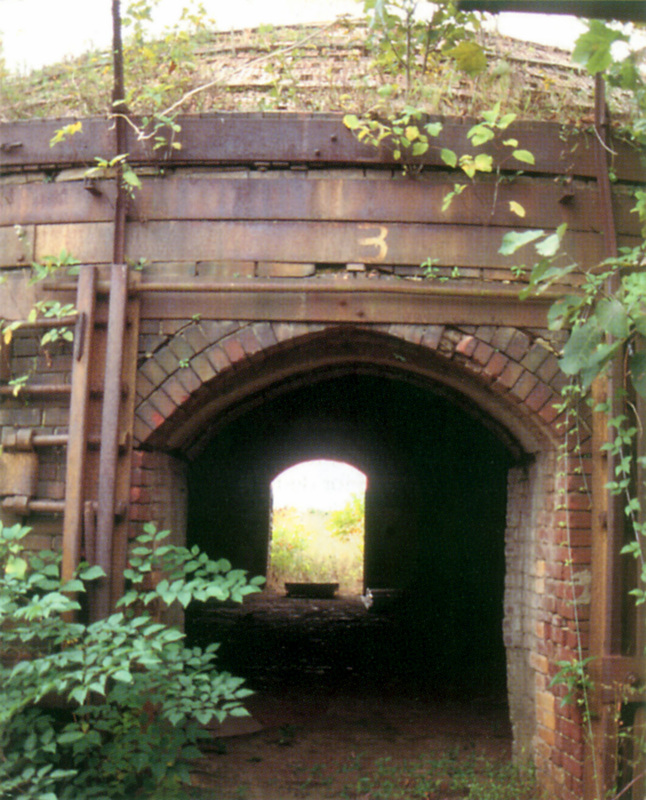 The plant was surrounded by hills containing a ready supply of material for brick production. The B & O Railroad tracks at the edge of the plant complex carried Medora brick to pave streets throughout the Midwest initially. In 1925 after financial troubles stemming from an economic slowdown prior to the Depression the plant went into bankruptcy. It was then purchased at auction by the owners of Jackson Brick & Hollow Ware Co. of Brownstown, Indiana. Thereafter the Medora plant concentrated on wall brick for facing new buildings while the Brownstown company focused on drain tile. Joseph Robertson served as President of both companies until about 1941. After WWII James P. Heller became President. 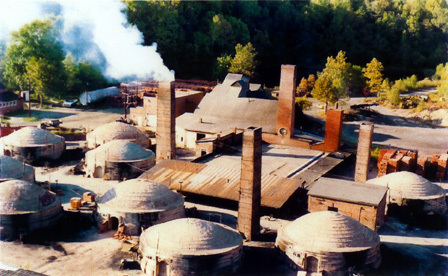 The plant operated between nine and ten months out of the year producing standard and custom brick until it officially closed January 31, 1992. Medora resident today, Bernard A. Gray worked the plant since 1946 and was Superintendent for the plant's last 24 years of operation. His father Ralph was superintendent before him beginning in about 1935. His brother Erridine served as the plant's salesman. Bernard Gray knows brick. Especially Medora Brick! Several interviews with Mr. Gray are included in this website along with photos from his personal collection as well as from others. 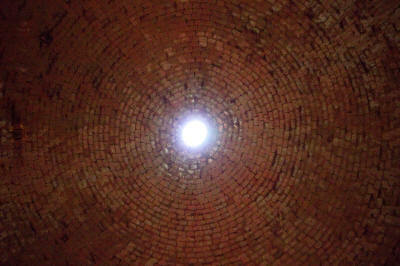 The company had over the years built a complex of 12 brick kilns with 7 tall square stacks complimenting them. The round, domed (beehive) kilns have arched doors on two sides along with 10 small openings at the their base for feeding the kiln's fire. A long, covered storage shed was constructed parallel with the rail siding. A smaller shed sat in the middle of the complex. Also still standing are a horse barn with an employees changing and showering addition with accompanying 2-holer frame outhouse, a machine shop and power plant building , walls of another brick building and the small office. The large frame shale processing & brick forming building was dismantled after the plant ceased operation. The mechanicals and equipment were taken to other brick plants in Indiana. In 2004, the site was named to the 10 Most Endangered Landmarks list by the Historic Landmarks Foundation of Indiana. Eleven domed kilns remain with 5 stacks (the 'five sisters') along with four small buildings. May of 2008 a state historical marker commemorating the brick plant is set in downtown Medora for the most people to see. December 2017 - brick plant owner Troy Darkis transfers the plant property over to the Save the Medora Brick Plant non-profit organization. The plant site points to our proud industrial and local heritage with a special bow to the plant workers and their families. Photo of kiln dome by Jim Walls of Bloomington, Ind. Decication of the historic Medora Brick Plan to the new owners, Medora Brick Plant and Historical Sites, Inc. was held Memorial Day late afternoon Monday May 28, 2018 at the plant site located at 4202 W. County Rd 425S, Medora. 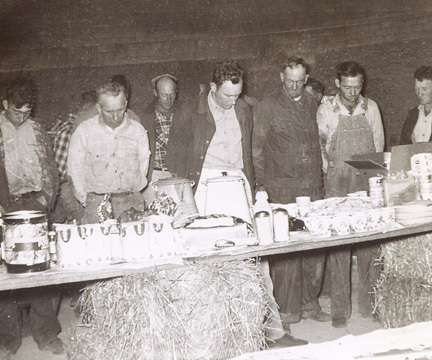 The public was invited and attendees included former Medora Brick Plant employees and their families. Hot dogs and drinks were served. Balloons were given to children. Music provided by local talents. Save the Medora Brick Plant Movement!!! 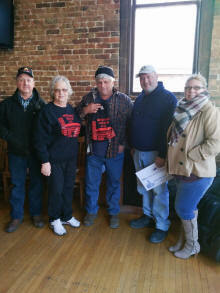 Save the Medora Brick Plant organization Board of Directors signed papers to take possession of the plant property from owner Troy Darkis. Public Support and Participation Meetings have been held the last Monday each month at Medora Senior Center since since Sept. 2016 on the subject of the plant property's preservation and uses. Monthly meetings at the Medora Senior Citizens Center at 52 W. Main St., Medora. New participants welcome! Help get the story of the brick plant correct! What do you know about the brick plant's history? And how do you know it? Do you have photos? How are names mentioned here familiar to you?